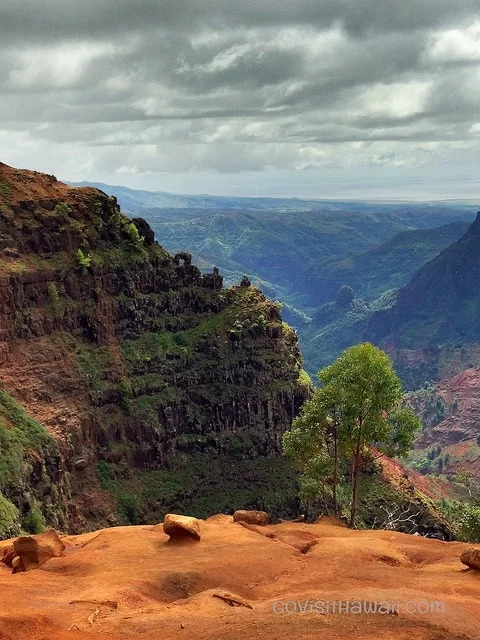 One of the sights you’ve got to see on your Kauai vacation is Waimea Canyon. Seeing the Grand Canyon of the Pacific from a lookout is great, but to stand along a cliff edge — that juts out into the canyon for a 360-degree view — is even better. The Cliff and Canyon Trails are definitely among our favorite Hawaii hikes. We first hiked these trails back in 2003 and nearly ten years later, we jumped at the opportunity to hike it again. The name of these trails — Cliff and Canyon — are a bit confusing. We’ve even seen maps that designate part of the trail as “Waipo’o Falls Trail.” You may see them interchangeable used. From my research and understanding, the Cliff Trail is simply a short spur (approximately 0.5 mile roundtrip) off the Canyon Trail. To get to Cliff and Canyon (Waipo’o Falls) Trails, start from Highway 550 between mile markers 14 and 15. Look for a dirt road and a small gravel/dirt parking area. Unless you’re the first hiker of the day, you’ll most likely see parked cars. I’ve seen this dirt road named two different ways — Halemanu Road and Hale Manu Valley Road. Follow the dirt road down to a clearing, which is another parking area where locals will park. We don’t advise driving and parking in this clearing for two reasons. First it’s a violation of rental car agreements to drive dirt paths. Secondly, the hard-packed dirt road is filled with ruts and it could be dangerously slick in/after rain. Cross the clearing and look for the Canyon and Cliff Trail heads off to the left. You’ll soon see the fork in the trail where you choose between the Canyon Trail (left) or Cliff Trail (right). Once you get to this point, if your time is limited and/or you’ve found the trail to be more strenuous than you expected, simply go to the Cliff Trail for the views and turn around. Otherwise, we recommend hiking both trails which will total just under four miles of moderate/strenuous hiking in total. The Canyon Trail descends through a green canopy of trees. 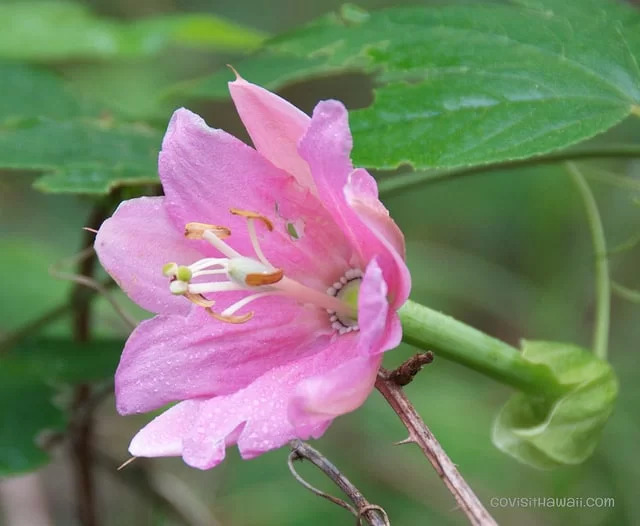 Some of the most unusual wild flowers periodically line the path. The sounds of chirping birds add music to accompany the trail. Canyon views are very limited along the trail — that is until you reach the clearing into the canyon. There, the views are dramatic — the rough, orange and green cliffs give way to a distant ocean view. Once we made it to the canyon view, we probably spent 15 minutes or more just enjoying the scenery. Some folks carry on down towards Waipoo Falls, which is approximately 0.2 miles further down. We did that in 2003 and didn’t find it worth the extra effort. The trail leads to the top of the waterfall, so you don’t even get to see it. There is a smaller waterfall upstream that feeds Waipoo, but with the growth of plants and shrubs it may be difficult to see. Depending on recent rainfall, you may not even see a waterfall at all. I should also mention that the trail down to the top of Waipoo Falls is extremely treacherous — one slip and it’s a quick visit to the canyon floor hundreds of feet below. When you’re ready to head back to your car, you’ll follow the same path back up. Once you reach the parking clearing that we mentioned earlier, you can carry on back up the same dirt path that you followed to the trails. If you have the energy and want to return a different path, look for the Pu’uhinahina Trail head that leads to the Pu’uhinahina Lookout and then walk along the side of Highway 550 back to your car. It’s a little bit longer that way, but offers new scenery. – You can purchase trail maps and get advice from the Kokee Museum, between mile markers 15 and 16 on Highway 550. – Wear shoes with tread for trails – like hiking shoes or trail running shoes. I wore these shoes. – How strenuous are these trails? They’re mostly downhill to the views and uphill back to your car. I was able to hike these trails and more in the same day even though I had a cold. Footing can be tricky in spots when dry and extremely slippery after/during rain. – Bring water, ideally two liters per person. – With the higher elevation, you may encounter chilly temperatures. So, you might want to bring a lightweight, waterproof jacket and/or wear long sleeves and long lightweight hiking trousers. Check the temperature before you hit the trail to see if you need to bring the jacket with you. – Ideally, bring a hiking stick. We went here last year and LOVED it. So pretty! Great images and video! Makes me want to book a flight! We are in the beginning stages of planning a Kuaui trip this December(have been to Honolulu, Wailea, and Lanai..now checking out another island!) and I can’t wait to check out the trail(s) here! Thanks for the detailed info! This looks fantastic, I’m planning my honeymoon to Hawaii and so excited about the trip. Would like to fit in a hike at Waimea Canyon although my Fiancee is a little anxious about hiking without a guide so would be grateful for any feed back as to whether you think this is necessary for this hike? (We’ve been hiking with my parents quite a few times who are v keen hikers but we are not experienced hikers). Also would be grateful for an idea of how long you allow to complete this hike? Rob – people hike this trail all the time without a guide. You need to be comfortable following maps. As best I can remember, this hike can be completed in about three hours. Many thanks Sheila, really helpful – fine reading maps so looking forward to this!